Experts used to tell dog owners not to bathe them too often, on the grounds that too-frequent bathing strips a dog's coat of valuable oils that keeps the fur smooth and glossy and may dry the skin. The recommendation used to be to not bathe your dog more than a couple times a year. However, most veterinarians and dog-care professionals are now recommending that dogs be bathed about once a month, and some dogs should be bathed even more often than that, depending on their breed, skin condition, and lifestyle. Bathing helps keep your dog clean and smelling good, can promote healthy skin and a healthy coat, and prevent pet health problems due to dirt and parasites. No matter the size of your dog or the frequency of bathing, it's a good idea to have specialised towels for dogs, rather than using your own. The Snuggle Safe dog towel is made of super absorbent microfibre, so it is lightweight and quick-drying. In the UK, where we experience wet weather many months of the year, dog towels are more important than they may be in other climates. Not only does our famous rain get a dog wet, but muddy conditions make it necessary to bathe dogs more often. Many people simply use old terrycloth household and bath towels for these purposes, and that is a simple and inexpensive solution. However, those towels are typically not designed to stand up to the dirt, mud, and hair that are frequently on a dog's coat, can take a long time to dry, and, in some households, there may be confusion about which towels are for the dog. Modern dog drying towels are designed to absorb far more water than terrycloth, manage dirt and mud, and be quick drying, which means that the same dog towel could potentially be used more than once a day. Because dog towels are so useful and necessary, Doggy Dream Team has taken a close look at the most popular dog towels today, to determine which is the best dog towel and why. Note that, while many people use dog onesies or dog towels with hoods, those designs are not as universal or versatile, and much more breed-specific. 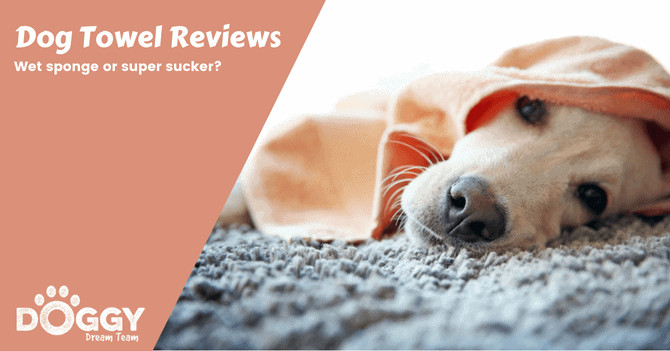 For the purposes of our review, we are examining simple dog towels for the easiest one-to-one comparisons, and the most useful recommendations. 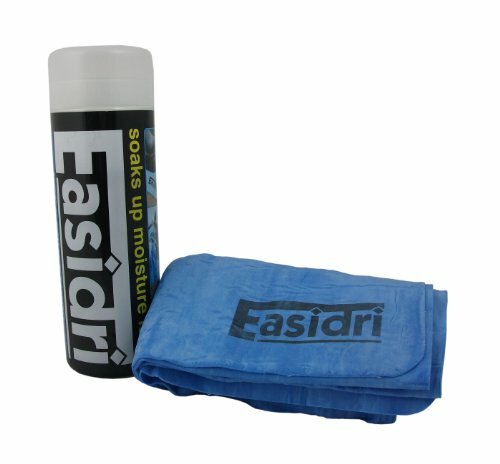 the Easidri towel is made of super-absorbent biodegradable polyvinyl alcohol. icrofibre towels for dogs’ speed drying time and easily remove dirt and mud from a dog’s coat. This durable towel will stand up to over 500 washing and drying cycles without losing absorbency. The Snuggle Safe dog towel is made of super absorbent microfibre, so it is lightweight and quick-drying. The generous size of this towel makes it a good choice for dogs of all breeds, and the spacious 140 cm x 76 cm makes it large enough to protect a car seat, wrap up a wet dog, or wick away all the water from a bath. This towel is inexpensive and durable, and many people find them so useful that they have purchased more than one. Overall, 90% of customers give this product high marks, and it’s a generous size for the price. The fact that it stands up to long-term use makes it an even better value. This dog drying towel is highly recommended. The Easidri grooming towel reduces grooming times by up to 60%. 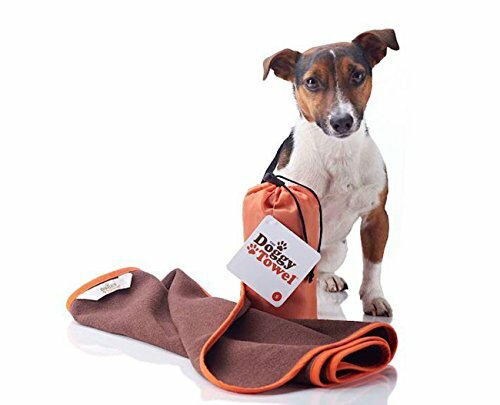 This washable, reusable dog towel can be disinfected for extra protection from parasites, and to eliminate odours. It is durable and resists tearing and shredding. Unlike other towels on this list, the Easidri towel is made of super-absorbent biodegradable polyvinyl alcohol. It should be rinsed in warm water and wrung out before each use and rinsed and stored damp inside the included container between uses. The medium size measures 68cm x 43cm. Most customers who have a negative experience with this product have treated it like a conventional towel, and not used or stored it properly. Some owners report that keeping the damp towel in the container for extended periods of time can make it smell a bit, but that it doesn’t mould, and the smell is eliminated with a machine wash. If it’s completely dried out, it can become stiff and unusable, so the Easidri shouldn’t be treated like a conventional towel and allowed to lay out to dry. While it may seem like a high purchase price relative to the size of the towel, this revolutionary material soaks up far more water than the dimensions would seem to indicate. This dog-drying towel is particularly recommended for dogs that swim or are bathed frequently, or for breeds with coats that retain a lot of water. The Ancol dog towel is made of microfibre cloth, so it’s super absorbent and easily washed. It measures 100cm x 50cm, so it is compact and portable, and is an attractive blue colour. Microfibre towels for dogs’ speed drying time and easily remove dirt and mud from a dog’s coat. Customers love how well this dog drying towel absorbs water. Customers find that the colour bleeds in the wash. This towel does an excellent job of drying smaller dogs, and knowing ahead of time that the colour will run will help customers wash it accordingly. It is a good dry dog towel. However, there are other comparable towels without the drawback of the colour bleed that you may want to consider instead. The Paragon Microfibre dog towel is a quick-drying, super-absorbent towel with a cute paw print design. 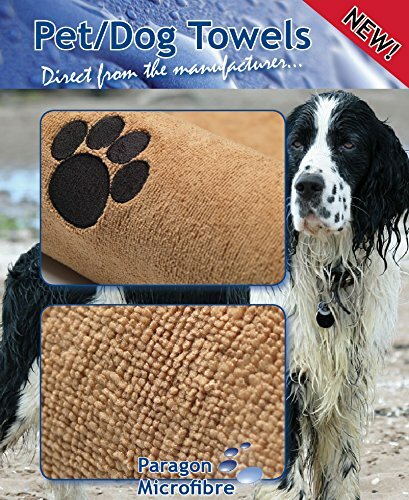 Made with 30% polyamide, it is extremely efficient at soaking up water and removing dirt and soil from a dog’s coat, and absorbs 10x the amount of water as a cotton towel. This durable towel will stand up to over 500 washing and drying cycles without losing absorbency. Heavy weight 300 gsm, with overall dimensions of 140cm x 70cm. Many of the negative comments about this product are about the properties of microfibre itself, which shouldn’t be considered a flaw in the product. However, if the product received isn’t as pictured, it can cast some doubt on the material properties of the product as well. A full 90% of reviewers have a positive experience with this product, so the small percentage of negative reviews shouldn’t outweigh the positive. It dries dogs well and quickly. However, the paw print emblem is cute, and it’s easy to understand the disappointment of receiving the towel without it. The Arcadian premium quality microfibre dog towels come in a choice of four vibrant colours, and weighs just 206g. These dog-drying towels can be air or tumble dried. They are also super absorbent and antibacterial. At 140cm x 70cm, they are large enough for bigger dogs and absorb a lot of water. Customers love these dog towels so much that they end up buying several of them. ” Great for drying soggy dogs!!! Some customers feel that more than one towel might be necessary to dry a large wet long-haired dog. Some negative comments seem to originate from customers who don’t understand the properties of microfibre, or who feel that they need more than one towel for their specific dog. It’s difficult to consider that to be truly a drawback of the product itself, which overwhelmingly lives up to its claims. 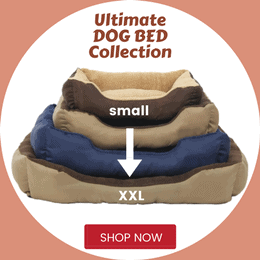 140cm x 70cm is a typical size for dog towels, and only a couple brands offer larger sizes. 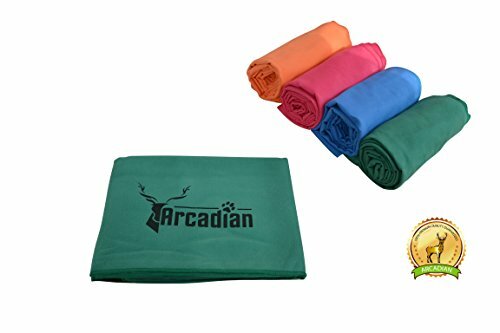 Arcadian offers a high-quality microfibre dog drying towel at a reasonable price, and with a choice of colours. The vast majority of customers are extremely happy with this dog towel, and it works well and lives up to expectations. 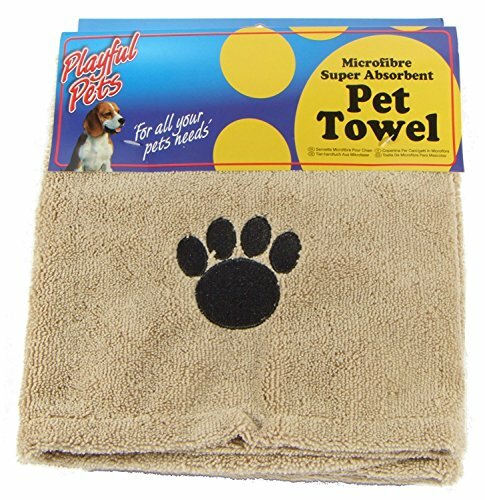 This large absorbent microfibre dog towel from Playfull Pets has a cute paw print emblem. It is super absorbent and dries quickly. This towel is inexpensive, and that seems to be reflected in the smaller size and slightly lower quality of the towel compared to others on this list. It measures 110cm x 71cm. 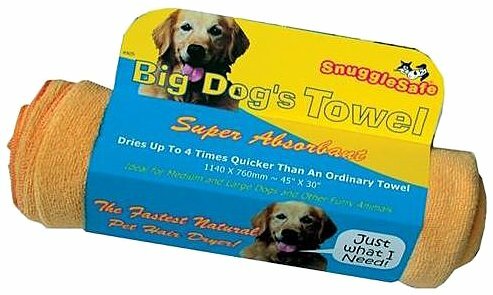 This is an inexpensive towel that does the job of quickly drying a wet dog. Some customers note a lower quality and lack of care in the manufacture, which is probably reflected in the low price of the product. However, some people don’t want to spend a lot of money on a dog-drying towel that will repeatedly get hairy, dirty, and muddy from a wet dog. Of more concern are customers who feel that the towel isn’t absorbent. After all, if it doesn’t do the job, then even a low price is a poor value. This product doesn’t have a lot of customer feedback yet. While most reviews are positive, the most helpful reviews are mixed, with positives and negatives. We’re giving it an 8 for value, but may need to re-evaluate when more people have used and rated the product. These DoggyBag @ WOWOO microfibre dog towels are super absorbent and dry quickly. They can be machine washed at up to 90° C and air or tumble dried. These are the biggest dog dry towels on our list, which makes them especially versatile; they are big enough to securely wrap around even a large breed dog, cover a car seat or sofa, and have excess room to both wrap around a dog, but also massage them to wick away moisture more quickly. Large is 140x80cm, Small is 100x45cm. DoggyBag @ WOWOO claims that these towels for dogs dry more quickly than anything else on the market, and they can be washed at higher temperatures. It comes with a convenient carry bag. Customers rave about this towel. None! But the numbers aren’t yet in. This microfibre dog dry towel comes at a step up in price from the competitors on this list. However, that may indicate that it is made from a higher-quality microfibre, as the manufacturer suggests. Without more detail as to the properties of the microfibre, and given the small number of (admittedly rave) reviews, it’s difficult to assess the overall value of this product relative to the purchase price. However, as the largest and highest-quality dog drying towel on this list, it’s definitely worth recommending to owners of large breeds. Many dog towels (and other towels as well) are currently made of microfibre. Microfibre is prized for being lightweight, super absorbent, quick drying, and durable. 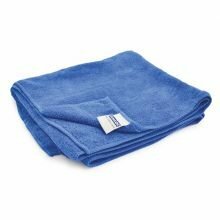 For people who are unused to microfibre towels, they may seem too thin or light to do a good job, since we associate the thickness of a terrycloth towel with how much water it can absorb. But thickness is not a guide to the absorbency of microfibre: split fibres are. The most absorbent and effective microfibre towels have split fibres. A microfibre towel without split fibres is simply a very soft cloth, and there are many uses for that type of material. But a microfibre cloth with split fibres will absorb liquid and dirt, which is the most important feature in the best dog towels. However, this labelling isn’t required of manufacturers, so it’s up to the consumer to determine the quality of their microfibre. For a quick test: If you put water on a smooth, flat surface and push the corner of the towel into it, split fibre microfibre will absorb the water, while non-split fibres will instead deflect the water. Split fibres also make the surface of a towel rough to the touch, and it will catch on imperfections. For dog owners, split-fibre microfibre is ideal for absorbing water when a dog is wet, and the towel will quickly soak up mud and dirt, because it is designed to attract and hold small particles. Microfibre is also healthy for a dog’s coat, reducing frizz and damage to the hairs. Furthermore, many dogs dislike being wet, so the faster drying time of microfibre can reduce stress. For all these reasons, it’s our recommended material for the best towels for dogs. But, due to the splits in the fibres, if your dog has sticks, burrs, or organic debris that gets stuck in their coat, that debris will probably also stick in the towel and need to be removed by hand. It’s worth having an understanding of what microfibre is and how it works, because many people order inexpensive microfibre dog towels and then are unhappy with how little water the towel absorbs. And still other people get excellent microfibre towels and are unhappy with some of the specific features of microfibre: its thinness, and its tendency to hold on to particles and debris. An understanding of the features of microfibre may help you choose the right towel for you and your dog. While these are all excellent towels for dogs, our overall recommendation for the best dog drying towel is the Snuggle Safe Micro Fibre Dog Pet Towel It’s an excellent size for the price, works well, and has overwhelming positive feedback from customers. Our long shot would be the WOWOOO Doggy Bag as it is the biggest dog towel on the list and even though it is the most expensive and has the least amount of reviews they are all 5 star. In our opinion you can never have too much towelling when it comes to keeping pooch dry and warm.